The Red Wings and Maple Leafs have already met for an outdoor game in Michigan. But what if they did it again for, say, a Heritage Classic match-up in Canada? Cameron Ferguson has a great pair of uniforms for just such an occasion. As Freak Out Friday entries go, this is a fun one! Jack Phillips merges the old New England Whalers of the WHA with the New York Islanders’ new alternate logo. There’s no place for it in the NHL, but there’s always room on the Concepts page! Anyone else ever feel nostalgic for this classic Capitals jersey? Dallas Kirkpatrick wouldn’t mind seeing it as a Washington third. Count me in. 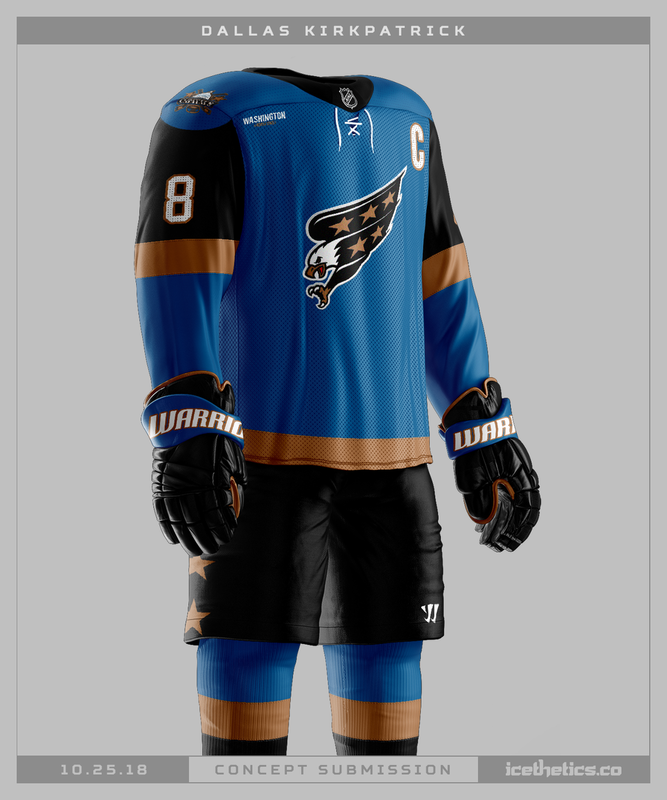 How long do you think before we see a gold third jersey in Vegas? Chris Fortier suggests this idea for the Golden Knights. The LA Kings really need to put purple back in the NHL. Seems that Lucas Daitchman agrees as he put together this set.